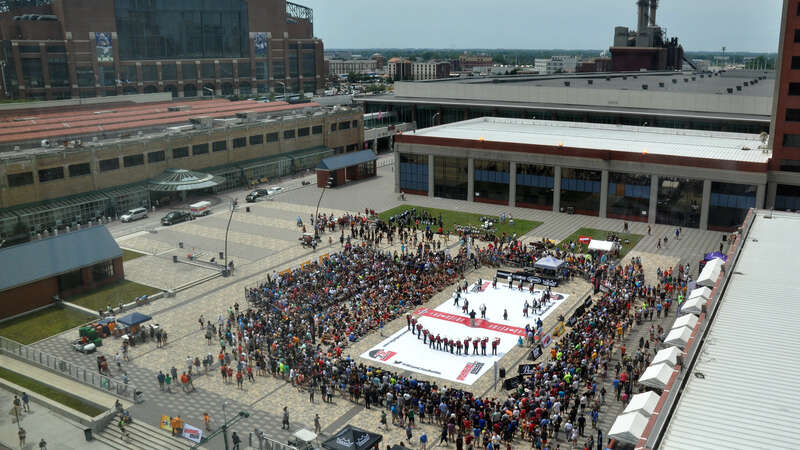 The 2015 DCI World Championship Finals kicked off with Drum Corps International's third annual DrumLine Battle, held on Saturday, August 8, in downtown Indianapolis. 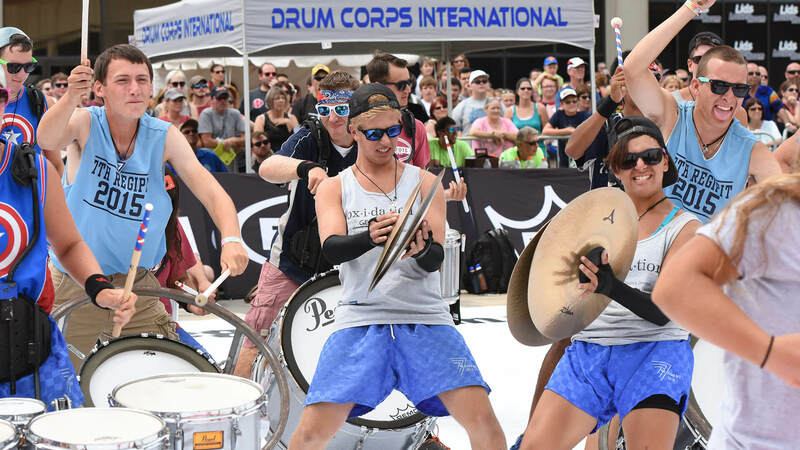 The competitive event allowed percussion ensembles to showcase their creativity while going head-to-head in a tournament-style bracket, with the overall winner in Indianapolis crowned the 2015 DrumLine Battle Champion. DrumLine Battle has seen significant growth since its founding in 2013, and during the summer of 2015, nine battles were featured in stadiums across the country as part of the DCI Summer Tour. Spectators gather on Pan Am Plaza in downtown Indy for DCI's third annual DrumLine Battle. Center Grove tenor drummer Eshaan Lothe, whose high school participated for the third straight year, enjoys DrumLine Battle events because they put members in a new and competitive performance environment. Building upon the success of last year's event, this year’s DrumLine Battle in Indianapolis once again featured performance arenas at Pan Am Plaza and on Georgia Street. The urban setting allowed onlookers to experience the up-close action right on top of the battles as they took place. "I love the environment for the battles so much," Indianapolis native Sarah Mealing said. “This isn’t a place that you would expect to see something like this, and it’s great to see these kids off the field in a new competitive type of environment. A returning fan of DrumLine Battle, Mealing brought her family with her this year to spread her love for the event. Participating teams in Indianapolis included Center Grove High School (Indianapolis), the Diplomats (Windsor, Ontario), Chien Kuo High School (Taipei City, Taiwan), McMaster Marching Band (Hamilton, Ontario) and the Calgary Stampede Showband (Calgary, Alberta), in addition to drum lines from DCI corps including 7th Regiment, Racine Scouts, Colt Cadets, Gold, Raiders, River City Rhythm, the Academy and Oregon Crusaders. Judges at this year’s DrumLine Battle in Indianapolis included a diverse panel of individuals from around the globe including Alan Thompson (Chairman, Drum Corps United Kingdom), Jeff Hartsough (Executive Director, Percussive Arts Society), Ruwen Yang (Chairman, Department of Percussion and Contemporary Music, Shanghai Conservatory of Music), Mark Bassett (Adjudication Manager, Drum Corps Europe), Mike Jewitt (TYC School & Youth Development Manager, Calgary Stampede Showband), and Alex Heitzkey (Staff, Directors Showcase International). Broken out into several different divisions, winners included 7th Regiment in Open Class, Center Grove High School in Independent Class, the Calgary Stampede Showband in International Class and the Academy in World Class. 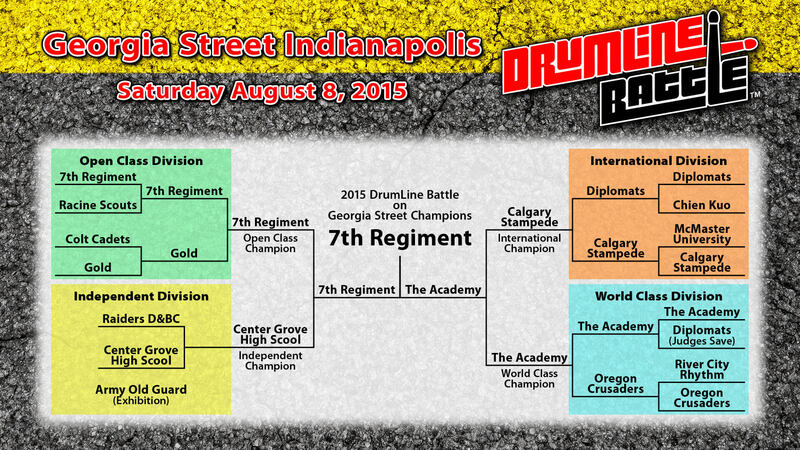 The overall DrumLine Battle Grand Champion for the day was 7th Regiment. With the Drum Corps International Tour now in the history books, the next DrumLine Battle event on the schedule is an international affair in Dublin, Ireland, which will take place on Sunday, August 30, in conjunction with the Gaelic Athletic Association at historic Croke Park.